Well folks, I fell of the Michaels wagon pretty hard this weekend. I hadn't stepped foot in the craft store the last couple months, quite the feat considering it was my second home last spring and summer as I prepared for my wedding. With a 30% off entire regular price purchase coupon in hand, I hit the aisles up yesterday afternoon and walked away with a haul. 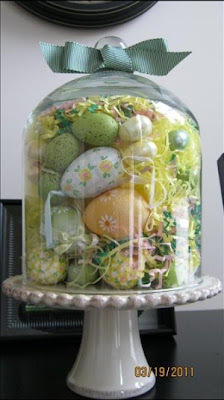 I picked up 3 sets of papier mache eggs and fake moss from the floral section. 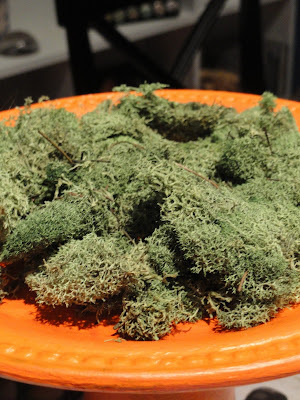 At first I had regular easter grass in my basket but, just as I had passed over the colored plastic eggs in favor of papier mache, I thought the moss would create more of a grown up look. I was about to head home and consider which of my hurricanes would look most normal turned upside down, but thought to stop at the Marshalls store above Michaels. I've been on the hunt for the Perfect Pillows for our entryway bench so thought Marshalls might have a hidden gem or two. 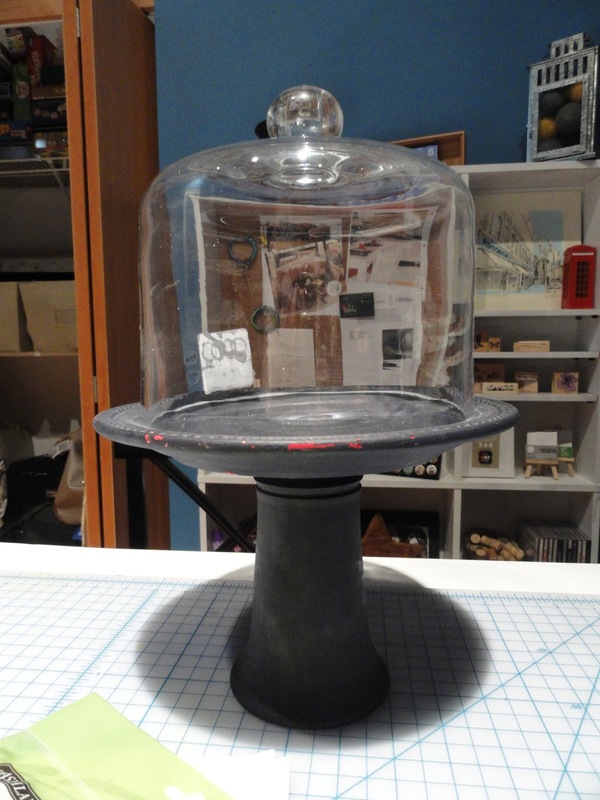 They didn't deliver in the pillow department, but when I saw a glass dome for $9.99 I didn't want to pass it up. Long after its life as a centerpiece we can use it during parties over the cheese plate or other items to keep fresh. Sitting the dome atop a plate would not give this guy much height, so I was doubly pleased when I discovered it was the perfect fit for a stand I already had. I created two stands out of small plates and candlesticks just ahead of the wedding and they have also come in handy during the holidays as mantle decor. I first made a homemade cake stand early in this blog's life to act as tub decor (also my first posted IKEA Hack). I actually repainted it navy blue to act as our cake stand at the wedding since it was a perfect 12" in diameter. 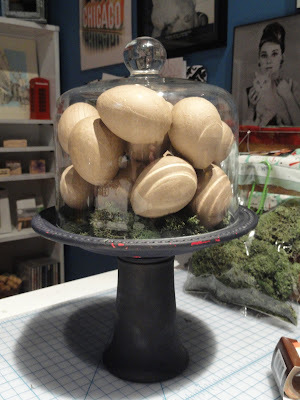 To get a feel for the look, I filled the dome with eggs and set it atop the stand. Before I laid some moss down the eggs didn't fill the dome quite well enough, but once the greenery was in place we were cookin' with gas. I decided to repaint the stand to match our already existing table centerpieces (a Fiestaware pitcher and a silver bowl with a pop of orange). Because my orange paint was much lighter than the dark blue paint color and red of the original plate, I scrapped off what I could of the old paint with a wet paper towel and sandpaper. 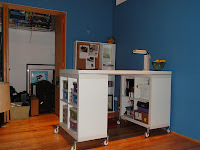 Many coats later, the orange mixed in with some of the blue and red still left. This actually helped darken the color up a bit so it wasn't quite so neon. In between applying orange coats onto the stand, I got to work on the eggs. I focused on pastel colors, mixing white paint in with the darker greens and purples to be nice and Eastery. 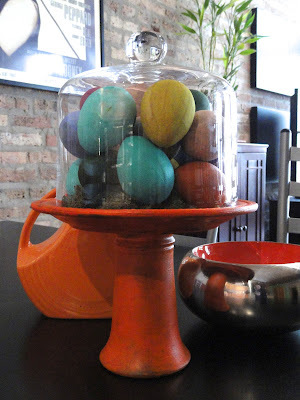 I had visions of ombre eggs, elaborate patterns and using a couple rolls of washi tape I had picked up at Michaels, but in the end keeping them solid had the simple and not too over the top effect I was looking for. 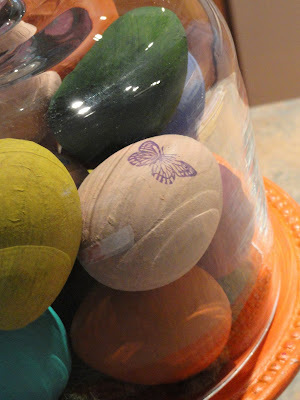 I did give one of the peach eggs a mini-accent with a butterfly stamp and purple ink pad. I messed up a couple times on the stamp before I figured out the right application level on a rounded surface! The key was to press down all four corners separately. Once everyone was dry, I laid the moss back down, filled the dome with eggs and carefully put it into place. 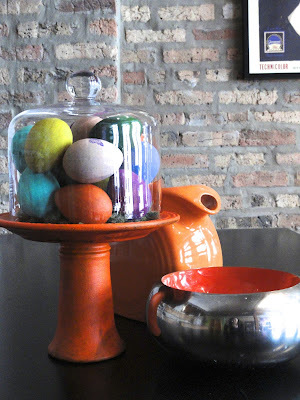 So now we have a happy reminder of Easter and Spring on our table - the question is, how long after Easter is it kosher to keep as a centerpiece?? 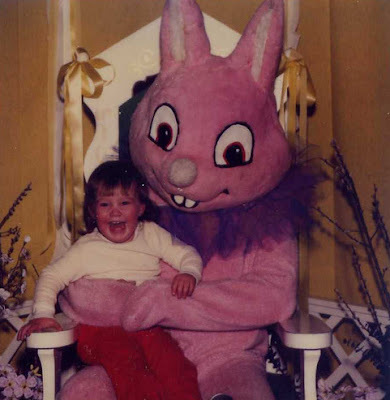 Have a wonderful Easter Sunday - eat lots of ham, devil lots of eggs and - whatever you do - DON'T let your kids sit on one of these Easter Bunnies!